Having a cross-eyed look is very normal for newborns. Sometimes babies are born with extra folds of skin in the inner corners of their eyes, giving them an appearance of crossed eyes. As these babies grow, however, the folds start to disappear. Also, a newborn infant's eyes can appear to cross from time to time. This normal occurrence is due to a lack of development at this stage in their lives. It is normal for a newborn's eyes to move independently of each other. The cross-eyed look sometimes causes much concern for new parents. However, by the age of three or four months, an infant's eyes should be straight and able to focus on objects without turning outward or inward. 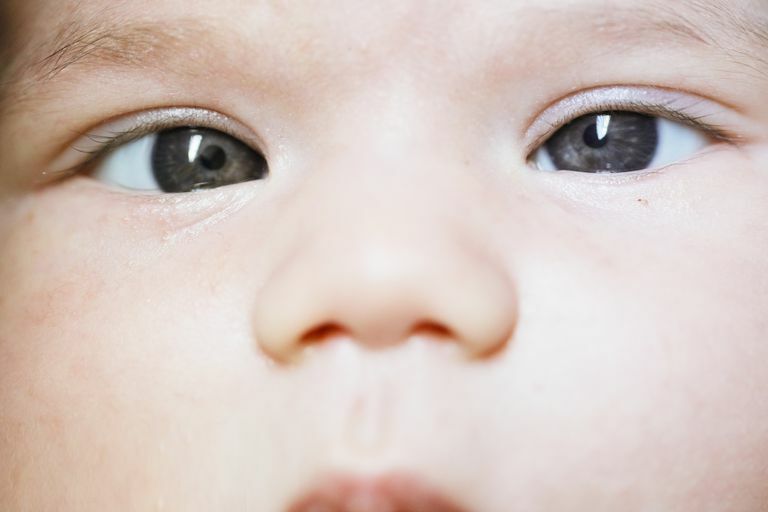 If your baby is older and her eyes continue to cross, move inward or outward, or don't appear to focus together, strabismus might be to blame. Strabismus is a misalignment of the eyes resulting from a failure of the eye muscles to work together. Early detection of strabismus or other eye disorders is important for preserving a child's future vision. An eye doctor can perform several tests on babies and young children to determine if treatment is needed. If your child has strabismus and does not receive proper treatment, her brain could actually start to ignore the messages sent from one of her eyes. Strabismus sometimes runs in families, but it can also show up in children with no family history. When genetics don't seem to play a role in the development of strabismus, a significant vision problem is usually diagnosed. Children with cerebral palsy and Down syndrome seem to have a higher occurrence of strabismus. Premature babies and low birth weight babies are also at higher risk of developing strabismus, as well as children with farsighted vision. Strabismus can usually be corrected with glasses and is usually successful if it's caught early in a child's life. Sometimes, however, wearing glasses is not enough to correct strabismus and treatment may include surgical correction. Eye doctors will operate on the eye muscles, maneuvering them to pull the eyes into the correct position. It is normal for an infant's eyes to cross, as vision development is in its early stages. The eyes should straighten and appear normal by three or four months of age. If you suspect that your baby has a vision problem due to crossed eyes, make an appointment with an eye doctor. If your baby has an eye turn problem, the sooner treatment is started, the better the results will usually be.